ChronoZoom is an open-source community project dedicated to visualizing the history of everything. Big History is the attempt to understand, in a unified, interdisciplinary way, the history of cosmos, Earth, life, and humanity. By using Big History as the story line, ChronoZoom seeks to bridge the gap between the humanities and sciences and enable all this information to be more easily understood and navigated. 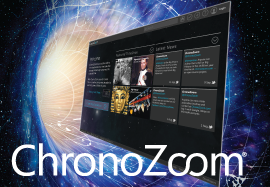 ChronoZoom was developed to make time relationships between different studies of history clear and vivid. In the process, it provides a framework for exploring related electronic resources. It thus serves as a “master timeline” that ties together all kinds of specialized timelines and electronic resources and provides visual intersections of the humanities and the sciences. You can browse through history on ChronoZoom to find data in the form of articles, images, video, sound, and other media. Equally compelling, ChronoZoom enables users to chronicle history by creating timelines that cover spans of history ranging from billions of years to just a day or two. ChronoZoom links information from five major regimes and unifies historical knowledge collectively into a map of Big History. This project has been funded and supported by Microsoft Research in collaboration with University California at Berkeley and Moscow State University. We envision a world where scientists, researchers, students, and teachers collaborate through ChronoZoom to share information via data, tours, and insight. Imagine a world where the leading academics publish their findings to the world in a manner that can easily be accessed and compared to other data. Imagine a tool that allows teachers to generate tours specific to their classroom needs. This is the potential of ChronoZoom. How do you organize huge amounts (terabytes and more) of different types of data (such as audio, video, text, PDF files, and images) logically and so they’re easily consumable? How do you retain precision while displaying historical information ranging from billions of years ago to today on one scale? How do you prioritize content when you have multiple items for the same time period? For example, an Egyptian history timeline, a Chinese cultural history timeline, an Islamic history timeline, a Japanese-American history timeline, and a particle physics timeline might all share a significant event on the same date in the year 1890—how do you display this on the timeline canvas? How do you efficiently draw elements on the canvas by using HTML Document Object Model (DOM) graphical elements and not sacrifice CPU usage? How do you ensure the same experience on multiple devices, operating systems, and browsers, so that users will have the exact same experience whether they use a Mac, PC, iPad, iPhone, Windows Phone, or Android device? How do you make a third-party authoring tool that is intuitive enough for middle-school students and rigorous enough for scholarly researchers? Should there be a bias toward author-built timelines or toward automated timelines that pull data from freely available datasets and libraries on the Internet? How do you compare multiple timelines and data sets? How do you retain the ambiguity of history? There are many interpretations of history, and much disagreement among experts about historical events; how do you ensure that students of history have access to the diverse historical information so that they can analyze it and develop their own interpretation of what happened? Microsoft Research and the ChronoZoom Project promote the establishment of relationships with academics and other partners (like publishers, researchers, museums, broadcasters, NGOs, foundations, and other organizations that have rich digital media content that crosses the sciences and humanities) to create valuable user experiences with this new technology. As data gets added to the platform, others can share access to enrich their experiences as well. Try ChronoZoom to learn about history or use it in the classroom. Join the community to suggest features and provide us with valuable feedback. If you are a researcher or are with a related organization and would like to provide resources for ChronoZoom—such as data visualizations, data management, and natural user interfaces—contact Roy Zimmermann. In early 2009, Roland Saekow decided to take the Big History course from Walter Alvarez at the University of California, Berkeley (UC Berkeley). Walter had created a series of timeline handouts created with a number of different methodologies. Fascinated, Roland was inspired to dedicate his student project to the study of timelines and thus sparked the inception of ChronoZoom as a way to examine the concept of Big History. Roland and Walter began to discuss ideas for an interactive timeline application and often exchanged drawings on the blackboard after class or quick sketches during office hours. Walter soon began using Adobe Illustrator to create mockups with limited zoom capability, but quickly discovered that the current graphics applications did not have a fraction of the ability to zoom on the needed timescale. Walter and Roland turned to the Office of Intellectual Property and Industry Research Alliances (IPIRA) at UC Berkeley, and put together a description of the project and rehearsed a demonstration of the prototype that they had built. The response from IPIRA group was phenomenal. IPIRA helped Walter and Roland arrange a conference call with Microsoft Research. They produced a seven-minute video that explained both the Big History timescale problem as well as an initial prototype—and ChronoZoom was conceived. IPIRA helped Walter and Roland arrange a conference call with Microsoft Research. They produced a seven-minute video that explained both the Big History timescale problem as well as an initial prototype—and ChronoZoom was conceived. A small but highly dedicated team at Microsoft Live Labs produced the first version of ChronoZoom. It was capable of zooming from a single day all the way back to the Big Bang. This impressive accomplishment was achieved in time for Walter’s Faculty Research Lecture, where ChronoZoom made its worldwide debut. 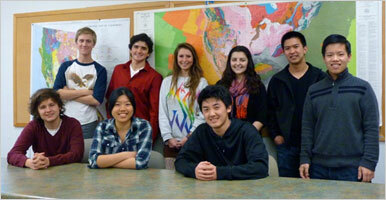 Walter had been selected as one of two faculty members to give the annual talk to the UC Berkeley community in 2010. UC Berkeley wanted to create an intuitive, easy-to-use, dynamic cloud service that could have multiple data sets available. In the alpha attempt, we focused on an extensive back end that could handle hundreds of thousands of terabytes and multiple data types, but ultimately, the user interface was far too complicated. The team changed focus to an intuitive user experience on a very easy-to-use tool and then expanded to include members of the humanities and science communities who were interested in using ChronoZoom for research and teaching. The Microsoft Research Connections team helped establish the collaboration between the Microsoft Live Labs and UC Berkeley teams. With an investment in a dedicated engineering effort as well as funding for student contributions, the next phase of ChronoZoom was secured. It was agreed that Berkeley would continue to be the primary visionary of the project, but would take on an additional role of content management. The power of ChronoZoom would only be evident if the content and the stories they told were compelling, and so a group of students were employed to research, collect, analyze, and finally create the content elements inside the ChronoZoom beta version. The Live Labs team at Microsoft had been disbanded and so the project was in need of new technical leadership. 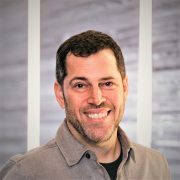 The Microsoft Research Connections organization had been growing their own top-notch engineering team, and this team brought to bear more than 50 years of collective software development experience to the effort. As the project goals and strategy unfolded, we knew that we needed to react to changes in the technical strategy in the market if we wanted it to have a viable future. The solution was to rebuild ChronoZoom from the ground up to take advantage of the power of Windows Azure for flexibility and scalability on the back end with HTML 5 and rich UI client technology to support the demands of a complex, infinite-zoom canvas and interface. We learned that ChronoZoom needed to focus on scalability and user interface. The decision to use HTML 5 had its share of drawbacks, and ultimately resulted in the need to re-evaluate the resource needs and skillsets required. We had a number of challenging obstacles to overcome. To fully realize the concept of ChronoZoom, developers had to create complicated math algorithms that could manage dynamic timeline behaviors as well as difficult scenarios such as leap years, no year 0, and Before Common Era timeline. We contacted the development team from Moscow State University and these students greatly helped advance the project during the latter half of 2011. They learned HTML 5 and how to integrate Jscript to produce quality animations and functionality. The team was fortunate to have the opportunity to bring on a new set of highly skilled student developers from Lomonosov Moscow State University. The complexity from both a technical and usability standpoint is immense in this project, and what might seem like a relatively short development cycle was pre-empted by a lot of hard work, re-work, and sometimes starting over. The philosophy we have used is to iterate regularly, obtain feedback at every chance, and to consider design and usability as a first priority. As a result, ChronoZoom beta is ready for mass consumption and feedback, structured to scale up to petabytes of content, and architected for the future of personal computing. Q. Why does the animation appear slow or jittery on my computer? A. ChronoZoom is designed to support computers that meet the hardware requirements for browsers that support HTML 5. On some computers, the graphics may be slower or less smooth than intended due to limited memory, processor power, or graphics capability. Q. Why don’t the graphics perform well in Firefox 10.x? A. Firefox 10.x automatically activates hardware graphic acceleration even if the computer doesn’t have a graphics adapter that can support this functionality. We recommend disabling the Firefox hardware graphics acceleration. Learn more. The following important contributors have made ChronoZoom possible. If you are interested in learning more and joining the ChronoZoom project, please contact Roy Zimmermann.